Last August I took the leap and started an Etsy site. I was a wreck for weeks before we launched. It was just so intimidating to actually put my work out there. I was far more concerned that no one would like it than I was that anyone would buy it. That came later :). It was so worth it! I found validation on Etsy. People did like my work and I even do pretty well selling it. YEAH! But FAR more importantly I found a community of people that are incredibly supportive of each other. One of my favorite Etsy finds was Shelley from Singlestone Studios. She is an amazing artist who's vinyl wall graphics are truly unique and extremely well crafted. She has been extremely supportive and has even gone so far as to surprise me with matching graphics for this blog and my etsy site. I LOVE them!!! Many artists try to operate in a vacuum. They are missing so much by not "making friends". We don't create in a vacuum. We absorb everything around us, including the work of other artists, I truly believe that it is part of who we are. I have been so blessed by the Etsy community, the sellers and the buyers, that I truly consider them to be the best thing about my time there. So anyways, please check out Shelley's etsy site and her blog- they are both full of eye candy for the color and design enthusiasts! 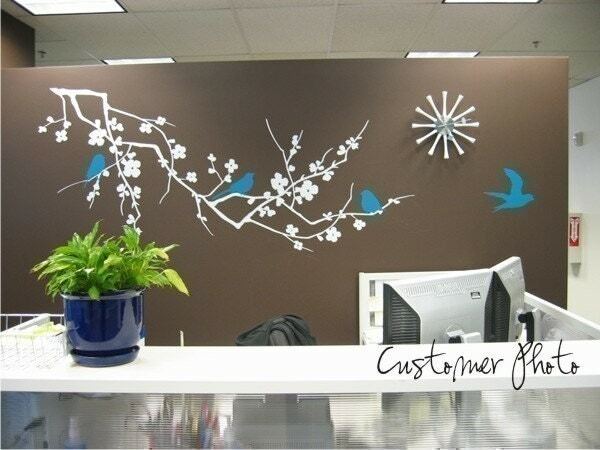 Here is one of my all time favorite wall graphics from her site. Wouldn't it look lovely in your home? Thank you Jen! You rock! I love your work - still use my awesome keychain!! People notice it everywhere I go :) It's so dang cute! Jennifer, you've told me to check out this artist's work and I just haven't gotten around to it so THANK You for posting it. Now I have to go see!